Ahh...That bean bag is helping! We are proud to announce that Ahh! Products bean bag chairs play a starring role in a new TV movie series aimed at helping kids deal with cyber bullying. This project, Adina's Deck, is the idea of Ms. Debbie Heimowitz, a Stanford University Masters student. Ms. Heimowitz's concern about cyber bullying led her to research and document what cyber bullying is and how it affects kids, especially girls. To spread the word and help, she created Adina's Deck. Our bean bag chairs are used exclusively in the major parts of the script, as "funky, cool bean bag chairs for Clara's room (one of the main characters). Her clubhouse is the main hang out spot and it has to look awesome! ", says Ms. Heimowitz. Adina's Deck is an interactive TV movie series geared towards girls ages 9-14. The story focuses on the adventures of 4 technology-savvy girls who solve crimes committed using the Internet. Cyber bullying is the main focus of the entire series. 4. To provide young kids the opportunity to see various scenarios, and giving them the interactive ability to "choose a path" and see the outcome. 7. To give parents a way to open dialogue with their children about cyber bullying"
The pilot episode of Adina's Deck films in the San Francisco Bay Area in May 2007. Our bean bag chairs will be featured in the pilot, as well as subsequent shows. 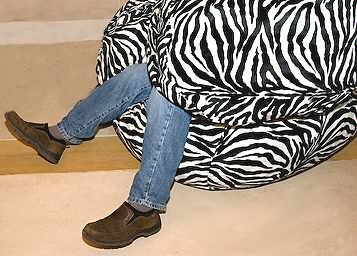 Look out for our 52" giant zebra fur bean bag chair, 37" premium olive and eggplant velvet bean bags, 37" zebra fur bean bag, and 27" small spearmint velvet bean bag chair! To learn more, visit adinasdeck.com. That bean bag chair was hungry!